Stay at the Aloft Sunnyvale and enjoy our location that is near Mountain View and within walking distance to world-class shopping, dining and entertainment. It's also just minutes away from the Apple Campus, Santa Clara Convention Center and California's Great America. There's even a train near the hotel that can take you into San Francisco. When you stay at our hotel, prepare to be pampered from head to toe. 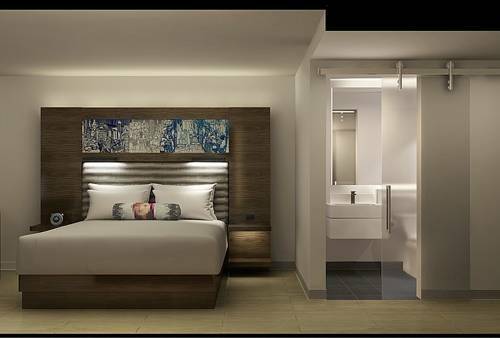 Our spacious rooms feature our ultra-comfortable signature beds, complimentary high-speed Wi-Fi, Smart TVs and walk-in showers with custom amenities from Bliss Spa. Your room also has a plug-and-play connectivity station that can charge all your devices at once and link them to your television. Plus, you'll never be left wanting, thanks to our Re:fuel snack bar, W XYZ Bar and convenient pantry, open 24 hours. If you want to unwind and work out, our Re:mix lounge and fitness center provide everything you need on the road. You can even bring your pet with you to stay at Aloft Sunnyvale. Re:fuel by Aloft : Refuel your body whenever you need it at Re:fuel by Aloft , our 24-hour grab-and-go gourmet pantry. Create your own meal, make your own cappuccino and enjoy your food they way you want it, quick, easy and delicious. W XYZ Bar: Grab a drink, listen to some mood music, and mingle with your friends and other hotel guests at W XYZ Bar. Our lounge serves perfectly mixed cocktails along with an impressively large beer and wine selection in Sunnyvale.